This third floor oceanfront condo at the Kihei Surfside Resort is located on the sought after ocean side of the elevator, and in the coveted “2 stack”, which are the closest to the ocean one bedroom condos in all of Kihei or Wailea, and definitely one of the best located units at the Kihei Surfside. It has a spectacular view from the kitchen, living room, dining area and lanai. It is one of the larger, 1 bedroom, 1.5 bath units (680 sq ft). The view of the ocean and its abundant wildlife is absolutely breathtaking. The entire unit was remodeled about 10 years ago, and the owners continue to upgrade the unit on an annual basis, this year installing granite kitchen counters, new dishwasher, new built in buffet desk area, glass shower enclosure and new carpet. The unit is clean, functional and shows well as the interior is predominantly neutral colors. We have just started renting this unit, so we do not have any ratings from our guest satisfaction surveys, but we believe that once we do, especially considering its spectacular oceanfront location, that it will score as a “Luxury” unit. The kitchen, bathrooms and lanai are tiled, while the entry hall, living room and bedroom are carpeted. The cabinetry is pearled oak, and the kitchen counters are done in lovely brown granite. The living room has a queen size sofa bed with 2 comfy, matching swivel/bucket rattan armchairs. There is also a large 37” flat screen LCD color TV with, DVR, and stereo. And of course, a multi speed ceiling fan. The dining area has a round rattan table with 4 matching armchairs. The entry hall has a built in buffet/cabinet with desk area with free high speed internet (Wi Fi) and free long distance calling to the United States and Canada, and a dresser with 6 drawers. The bedroom has a King size bed, multi speed ceiling fan and a digital security safe. The master bathroom has a full size, walk in shower with a built in bench. The matching half bath has been finished to the same standard. Both bathrooms have Kohler toilets. 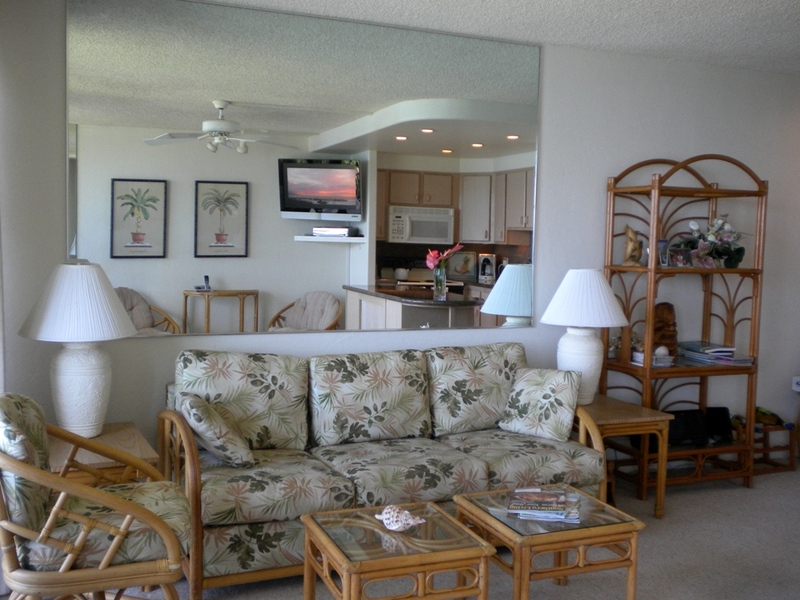 This unit is an excellent choice for guests who are looking for a spacious, higher end, comfortable condo with a great location and a spectacular unobstructed view of the Pacific Ocean and the West Maui mountains.